Around 6:50pm local time (1650 GMT) firefighters confirmed that Fire started in roof of Notre-Dame Cathedral. Around 7:53 pm Cathedral’s spire collapses and little later at 8:07 pm, the entire roof of collapses. In fifteen minutes at 8:25 pm, Paris’ Ile de la Cité, the island on which Notre-Dame sits, is evacuated by police. It was Meṣa (Vaisakha) saṅkrānti day although the Sun has crossed the 1° danger mark, it is still very fiery. It is in gaṇḍānta and vargottama showing that it would not be easy to overcome. Its transit in the 12th bhāva from the natal āruḍha of France (Taurus) shows losses and dangers. Moon is trine to the Sun transiting Magha gaṇḍānta nakṣatra, 3rd pada indicating that pets, wealth, food and in danger. Transit Saturn is in the 10th bhāva from natal Pisces Lagna generating kaṇṭaka (thorn, impediments) and with Ketu joining it, this has only become worse bringing in all sorts of accidents and mistakes into the picture. Jupiter the great protector is right at Mūla gaṇḍānta at 0°12’ completing the picture of all three sattva protections Sun, Moon, Jupiter – emasculated and incapable of protecting. The danger is in Sagittarius that indicates temples, churches, mosques and cathedrals besides teaching institutions. 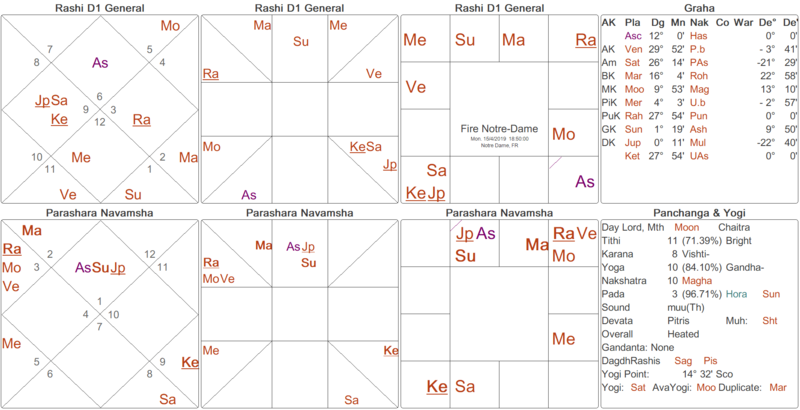 It is a Mars return to Taurus and is graha-dṛṣṭi (aspect) on Leo damages the Moon and on Sagittarius ignites Jupiter with Saturn and Ketu adding to the misery. 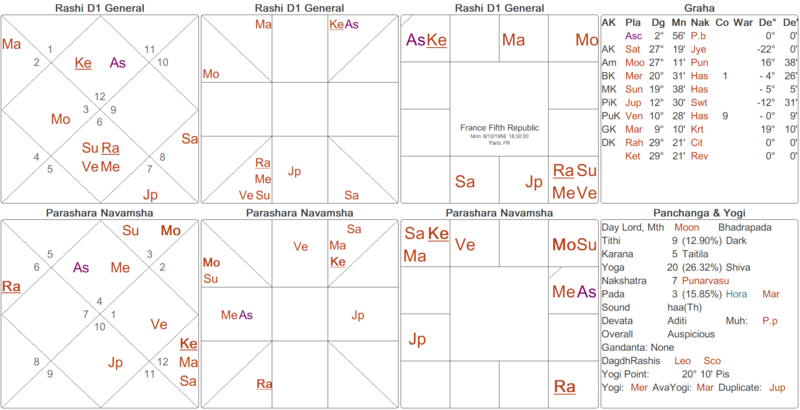 A look at the chart of France indicates the danger in Virgo which has the Sun-Rāhu conjunction in bādhaka rāśi threatening many problems and fires specifically. It is a kind of “suffering from black-magic” combination as the 6th lord Sun conjoins the bādhakeśa Rāhu in the bādhaka rāśi with a debilitated Venus and exalted Mercury. France has been reeling under the negative influence of a debilitated Venus since 2009. They need to learn that love can never be one-way. Pisces is very loving and caring and so are the Parisians, but the foreigners coming in are not always friendly, especially when they have no interest in assimilating the beautiful French lifestyle with its high culture and excellent food. However the fire at Nostre Dame occurred in Venus daśā Rāhu antara Mars pratyantara. Jupiter antara starts on 18th April, 2019 and even as we pen these words, we smile that the energy of France is going to change as French people will rebuild the Nostre Dame to prove that time has not eroded their skills and taste.